Christian is an independent sales rep with 22 years experience under his belt and has joined CommissionCrowd to find interesting new companies to connect with. He has kindly agreed to be interviewed and share his experiences with our members so that companies wishing to build a team of independent sales representatives can better understand this kind of sales professional. Qn. How did your career as an independent sales rep begin? Christian: My career as an independent sales rep (ISR) began in the spring of 2010. Since 1993 I had worked as an employed Key Account Manager and then later as a Sales Manager. I've always considered myself always as a self starter and - with increasing sales experience - I wanted to start in business for myself. Ultimately I wanted more freedom in my decisions and life and had also decided that the 9-5 corporate life wasn't for me. Qn. Can you tell us about one of your proudest achievements in sales to date? For one of my longtime principals I was able to stabilize the prices in which their services were sold at. My predecessors in my sales-region often sold with heavy discounts and I put a stop to this practice because the products and services being sold were absolutely worth the money we asked clients for. In the first year we lost some of our customers who were used to our easy discounting practices but over time we strengthened our relationships with our existing customers who were far more value oriented. This resulted in enhanced up-selling and cross-selling and increased the revenue of our Principal significantly. Also the quality of the new customers increased, because at the first encounter I make very clear that we are not the cheap guys. The gross margins are drastically better now. Qn. Can you tell us a little about the industry you work in? I'm selling high quality custom printed promotional products. The principal is a printing house that has been in the business for more than 60 years. It's a family business. They use up-to-date printing machines and have a huge know-how and expertise in their field. They can fulfill special requests (a big part of the business) this means better prices and a low churn rate. We are now in the sixth year of our cooperation. My second representation is relatively new. It is a company which has existed for around 25 years now. They develop cash register and merchandise management software. I'm focused on a very new product, an online cash register. They have also a very good know how and are great in constantly improving the product. Information flow works well and I can see this being a long-term relationship for sure. Christian: An independent sales rep is almost not bothered with in-house politics. He is not constantly nudged by a career-oriented sales manager. That means, that he can better concentrate on doing what we do well, selling! We also have existing networks of contacts and clients that have been built up for many years being out in the field. Our goal is to build portfolios of complimentary products or services that can be sold into our networks. It's rare for employees to possess these contacts and therefore companies end up paying a high price for employees who may or may not reach quota. We provide quick routes to market and tend to work with companies we know we can sell for. Qn. What qualities do you feel a good freelance sales representative must possess in order to be successful? Christian: In my opinion a freelance sales rep should have at least 3 years experience in sales under his belt before considering becoming self-employed. They should be able to get their time and travel management right. Generally they should also be very interested in the world of business in addition to sales. An rep should be constantly striving to improve their sales style and knowledge base. Learning, learning, learning! Sales should be an enchanting task, not a daily chore. A rep should know that bad times occur and how to deal with them when they happen. Qn. If you could give one piece of advice to companies looking to work with commission-only sales professionals, what would it be? Christian: Absolutely understand that an independent (commission-only) sales professional is the owner of their own business. They are your business-partners, not a source of cheap or free labour. Qn. What is the most important thing you take into consideration when deciding whether or not to sell a product or service? Christian: While I know that many salespeople are happy to work with startups and take new products/services to market, the independent sales opportunities I prefer to work with are from more established companies who's products or services have some track record of success in the marketplace. I also look for companies that provide incredible customer service. When I carry out my due diligence I also consider things like how their company website looks and what kinds of things have been written about them online. What about the marketing efforts in general? Who is the dedicated go-to-person? Is the company constantly working on the improvement of the product/service? What about the competition? What are the weaknesses of the product/service? Withholding or sugar coating information is not clever as generally we'll find the information we need but doing so is one of the quickest ways to lose our trust. Qn. What would you say are the main benefits for companies wishing to work with independent reps? Christian: It's likely that we've seen and experienced much more of the business world than most of your employed sales reps. We have existing contacts and can potentially accelerate your route to market. We cost less than employed sales reps because we run our own business and your products and services make up part of our portfolio. It's our business therefore we don't command a wage to run it. Qn. What advice would you give to employed sales professionals considering becoming self-employed? Christian: You should have been working within the sales industry and selling for at least 3 years. You should be very, very clear about the fact that you will now also becoming a business-owner and what this means also for your private life. You will be alone and you'll have to take on the challenges that any entrepreneur face when starting out. Give yourself about a year of preparation in the lead up to self-employment. Get information, read business related books and speak with other self-employed sales reps.
You should have a contract with at least one principal in the moment you quit your job. Besides the legal/tax stuff, you should have at least a second representation. The world of business is a beautiful place but it can also be a war zone. There are a lot of bad apples out there waiting for inexperienced people. That means you have to learn how to become a self-employed sales rep very quickly in order to separate the good ones from the bad ones. Always try to minimize your risk. Qn. What are your thoughts on CommissionCrowd? 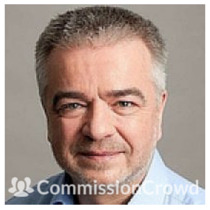 Christian: Some months ago I stumbled upon CommissionCrowd and my first impression was Wow! These folks know exactly what they are doing and so I registered immediately! To build such a feature-rich service of such a high quality you have to possess a deep knowledge about the world of self-employed sales. And they have it! The goal-oriented design of the service leads to results in a very short time. In fact I created my profile and had successfully made first contact with companies almost instantly. I also like the user experience: A fast running site, a clean layout and just a few clicks and you're done! I'm absolutely positive that this is the future for our industry right here.